Downtown Villa is located in the heart of Playa del Carmen with four spacious suites that can fit up to 18 guests! It is ideal for families with children, multi-family vacations, getaways, bachelor/bachelorette gatherings, and events. The villa is a very secure venue, as we have a security guard 24/7. 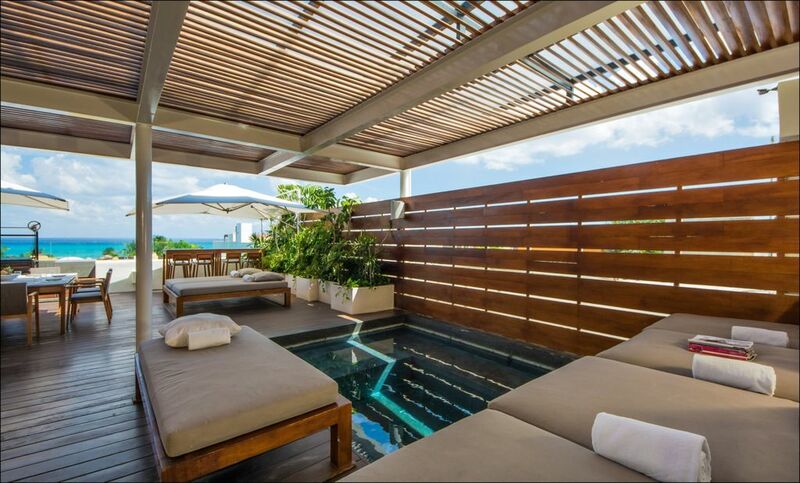 Each suite has an en-suite bathroom, TV, and private terrace with a plunge pool. Downstairs you will find a great room with bar and a large TV to gather and enjoy with family and friends, a formal dining room, and an outdoor beautiful quiet terrace to enjoy your coffee in the morning or some drinks in the afternoon. The ocean-view rooftop is the fun and main social area of the house. It includes bar, plunge pool, daybeds to get a tan, or chill out, dining table, and a BBQ where our astounding chef Miguel prepares delicious meals for our guests. Cleaning service every other day is included in our rates. Breakfast and chef services are available upon request at an extra cost. Our concierge can help reserve transportation, tours, restaurants, and anything you need! The garage is for two medium size cars. The beach is literally steps from the house and from the best restaurants and bars of Playa del Carmen. Contact us if you have any doubts! Please note that due to our location, noise from the bars and restaurants at night can be loud. I enjoy outdoor activities, reading and spending time with friends and family! From location, comfort, amenities and services, at Downtown Villa we strive so our guests have the best experience possible. Downtown Villa in unique in many aspects. Its architecture allows guests to feel private and calm. Also, being in the heart of Playa, walking distance from Quinta Avenida and the beach, is a luxury that no other villa in Playa offers. Chef service available upon request. The house was absolutely epic. We had a bachelorette and it was a wonderful experience. 10/10 rating! We had a group of 11 for a bachelor party and the house was absolutely perfect. The spaces were clean and well-appointed with plenty of room for everyone to spread out and relax. Proximity to the nightclubs was great (until it was time to go to bed!). But this is well documented throughout other reviews and the listing itself so we knew what we were getting into. The only minor complaint i had is that we heard rave reviews about the "BBQ" which we ordered - but all of the food/meat was prepared inside and we didn't get to see that beautiful grill on the roof in action, which is what we were all expecting. Other than that, great stay! Thank you so much for your review. We do apologize for our mistake on the BBQ order; unfortunately, our chef got confused. We will make sure this mistake does not happen again, as you are absolutely right on the fact that the BBQ prep and cooking is what was expected and what we want all our guests to experience! The staff at the Downtown Villa are the true stars - and the concierge team are superb, as well. The house itself is also fantastic, with a plunge pool on the roof deck + views out to the sea. Lot's of space, kept immaculately clean, along with 24/7 security. Just steps to the beach, and a great jumping off point for Cozumel, Tulum, and other adventures. You have to go in knowing the music of nearby clubs is loud each night - so best to bring earplugs you like (but the house also supplies them). That said, we got used to the music and enjoyed our trip thoroughly. Stayed here with 13 friends for a bachelor party and everything about our experience was outstanding. The house itself was perfect, plenty of space, clean, well appointed and modern. Location was fantastic and convenient to everything. Staff was incredibly friendly, accommodating and attentive. Highly recommend the chef service, the Santa Maria grill dinner we had was excellent. Would definitely stay again. Thank you for your kind review! Hope to have you all back soon! I need to start by saying this house is beautiful. Immaculately kept. The rooms and bathrooms are huge, clean and comfortable. The top floor is awesome. Great view and a great space to hang with friends. The staff is amazing. So accommodating and happy. They thoroughly clean the entire house every day. The security guards are there 24/7 to open the door for you. We felt extremely safe. The location is perfect. About 50 yards to the ocean, around the corner from tons of bars, restaurants and shopping. The food in Playa is amazing. We had insanely good meals. All that said, be warned this place is LOUD at night. If you are going for a bachelor or bachelorette party and plan to be out late at night, this is THE place for you. If you want to have more of a relaxing stay where you want good night's sleep, I might think twice. There are at least three huge, open air clubs on the corner of the street that BLAST music until 4am. The first night we stayed was rough, the second night we decided we may as well join the party, the last two nights we all finally figured out how to properly use the earbuds and were able to block out most of the noise. Again, I should say we thoroughly enjoyed our stay. It could not have been more comfortable, just would have liked to have a warning about the noise. Thank you for your comments Stephy! We are glad you had a good time and your coment on the noise is true. We will warn our guests about it, thank you for suggesting this to us. Amazing Property & Location - Stay Here & You Won't Regret It. I traveled to Casa Model with a group of 11 ladies for my bachelorette party. First & foremost, Ana was extremely helpful and straightforward in the entire process. She helped arrange transportation, private chef, and recommended restaurants and things to do in the area. The property itself is gorgeous. Super comfortable and spacious. The rooftop is surly a plus as there is plenty of spots to lounge and work on your tan. The pools are a nice touch as well. What really makes this property stand out is its location. 1 block away from the beach and within walking distance to 5th avenue and all restaurants, shopping, and bars. It really doesn't get better than this. Added bonus is the professional staff and security who work there to help with unpacking, cleaning, and really anything you need. Stop looking and book your family vacation, bachelorette party, group trip at Casa Model!!! Kimberly- Thank you so much for your kind review. Our greatest pleasure is that our guests have a memorable stay. We hope to have you and your friends back soon! Casa Model refund cancellation policy: Cancellations made 60 days prior to arrival date are refunded in full. Cancellations made in less than 60 days prior to arrival date have 50% refunds. Cancellations made in less than 30 days prior to arrival date are not refundable.